We did a major cull of books today – which was purgative, reminiscence-inducing and shelf-clearing.It’s a little odd clearing out lots of old books – even if they are destined for a good home. You’ve spent time in the company of something that someone has worked very hard to produce, even if it’s just some pulp novel destined solely for beach reading. And then it’s gone. We got rid of about 200 books – at left are a few of the bags of these soon to be discarded books. 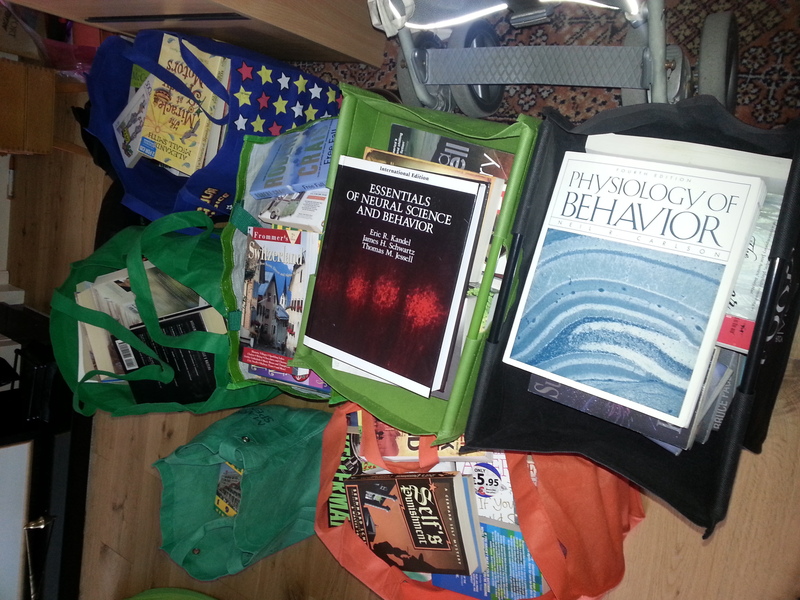 On top are old textbook copies of Kandel et al.’s Essentials of Neural Science and Behavior, and Carlson’s Physiology of Behaviour. My book of choice these days is An Introduction to Brain and Behavior by Bryan Kolb and Ian Q. Whishaw. long time ago (1982-1983 – I dated them for some reason). These books I had more or less completely forgotten I owned – thumbing through them brought me back to a time in reading where I hung around second-hand bookshops and grabbed whatever was going. 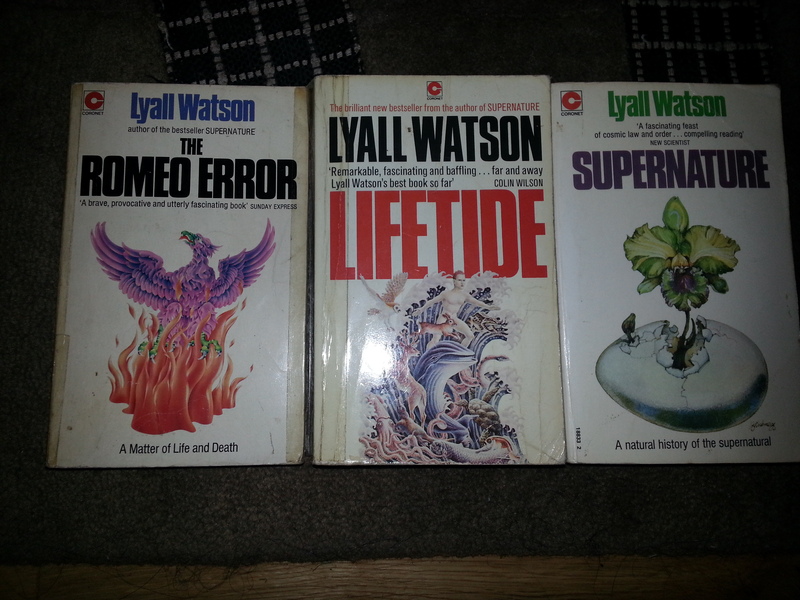 These particular books were by the late Lyall Watson (another obit: this also which revealed he lived out his final years in West Cork – something I didn’t know; and this blog wonderfully personalises him via the writings of his niece). These books were a phenomenon at the time – selling hundreds of thousands of copies. Watson was a curious combination of conventionally-trained scientist (botany and zoology as an undergrad, and a PhD in ethology, supervised by Desmond Morris of ‘Naked Ape‘ fame. These books are a curious collection of biology, anthropology, storytelling and credulously-accepted esoterica (including extended discussions of psychokinesis and telepathy, words which continue to refer to nothing at all). One of these books, though, did strike a note with me – ‘The Romeo Error‘ – an extended discussion of the transition from life to death, and how we can and can’t necessarily tell the difference between the two. (It goes far beyond this, of course!). There is now an important literature developing on differentiating between brain death, coma, persistent vegetative state, minimally conscious state and locked-in syndrome. It’s been a particular lecture topic for me this past year, and one which provoked lots of lecture-time discussion. Adrian Owen has pioneered hugely-significant work in this area: Detecting Awareness in the Vegetative State is a particular important paper (abstract at bottom; see also). I wonder if Watson (like Colin Wilson) will be remembered as one who managed to introduce people to ideas which might whet their curiosity for discovery? Not the worst of outcomes, by any means. There is a super piece on Mosaic about the evolving science on the detection of consciousness in severely brain-damaged individuals. I reproduce it in full below (allowed by Mosaic’s publication policy). Owen and I are talking on Skype. I’m sitting in London, UK, and he’s in another London three-and-a-half thousand miles away at the University of Western Ontario, Canada. Owen’s reddish hair and close-cropped beard loom large on my screen as he becomes animated describing the torment of those with no voice: his patients. People in a ‘vegetative state’ are awake yet unaware. Their eyes can open and sometimes wander. They can smile, grasp another’s hand, cry, groan or grunt. But they are indifferent to a hand clap, unable to see or to understand speech. Their motions are not purposeful but reflexive. They appear to have shed their memories, emotions and intentions, those qualities that make each one of us an individual. Their minds remain firmly shut. Still, when their eyelids flutter open, you are always left wondering if there’s a glimmer of consciousness. A decade ago, the answer would have been a bleak and emphatic no. Not any longer. Using brain scanners, Owen has found that some may be trapped inside their bodies yet able to think and feel to varying extents. The number of patients with disorders of consciousness has soared in recent decades, ironically, because of the rise and success of intensive care and medical technologies. Doctors have steadily got better at saving patients with catastrophic injuries, though it remains much easier to restart a heart than restore a brain. Today, trapped, damaged and diminished minds inhabit clinics and nursing homes worldwide – in Europe alone the number of new coma cases is estimated to be around 230,000 annually, of which some 30,000 will languish in a persistent vegetative state. They are some of the most tragic and expensive artefacts of modern intensive care. That year, he had moved to the Medical Research Council’s Cognition and Brain Sciences Unit in Cambridge, where researchers used various scanning techniques. One, positron emission tomography (PET), highlights different metabolic processes in the brain, such as oxygen and sugar use. Another, known as functional magnetic resonance imaging (fMRI), can reveal active centres in the brain by detecting the tiny surges in blood flow that take place as a mind whirrs. Owen wondered whether he could use these technologies to reach out to patients, like his friend, stuck between sensibility and oblivion. At the core was a deceptively simple question: how do we know that another person is conscious? This man has been diagnosed as being in a persistent vegetative state. But his family believe they have witnessed moments of recognition and evidence of consciousness. At their own expense they have taken him to Liège to see if he has locked-in syndrome. Half a century ago, if your heart stopped beating you could be pronounced dead even though you may have been entirely conscious as the doctor sent you to the morgue. This, in all likelihood, accounts for notorious accounts through history of those who ‘came back from the dead’. As a corollary, those who were fearful of being buried alive were spurred on to develop ‘safety coffins’ equipped with feeding tubes and bells. As recently as 2011, a council in the Malatya province of central Turkey announced it had built a morgue with a warning system and refrigerator doors that could be opened from the inside. The problem is that the scientific definition of ‘death’ remains as unresolved as the definition of ‘consciousness’. Much confusion is sowed by the term ‘clinical death’, the cessation of blood circulation and breathing. Even though this is reversible, the term is often used by mind–body dualists who cling to the belief that a soul (or self) can persist separately from the body. Today, however, being alive is no longer linked to having a beating heart, explains Owen. If I have an artificial heart, am I dead? If you are on a life-support machine, are you dead? Is a failure to sustain independent life a reasonable definition of death? No, otherwise we would all be ‘dead’ in the nine months before birth. The issue becomes murkier when we consider those trapped in the twilight worlds between normal life and death – from those who slip in and out of awareness, who are trapped in a ‘minimally conscious state’, to those who are severely impaired in a vegetative state or a coma. These patients first appeared in the wake of the development of the artificial respirator during the 1950s in Denmark, an invention that redefined the end of life in terms of the idea of brain death and created the specialty of intensive care, in which unresponsive and comatose patients who seemed unable to wake up again were written off as ‘vegetables’ or ‘jellyfish’. As is always the case when treating patients, definitions are critical: understanding the chances of recovery, the benefits of treatments and so on all depend on a precise diagnosis. 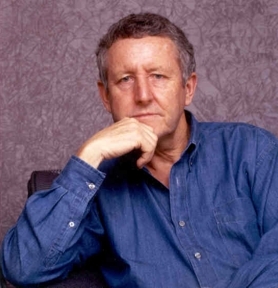 Pioneering work to understand and categorise disorders of consciousness was carried out in the 1960s by neurologist Fred Plum in New York and neurosurgeon Bryan Jennett in Glasgow. They were the odd couple. Jennett – or ‘BJ’, as he was known to colleagues – was reserved and gentlemanly, with an unusually penetrating and analytical mind. Plum was larger than life, commanding and an inspiring teacher who was famous for his idiosyncratic ways of diagnosing neurological conditions. ‘Fred Plum stories’ abound: he would diagnose hemispatial neglect (where damage in one cerebral hemisphere makes a person behave as if their opposite side does not exist) by seeing if the patient could tell if his glasses were askew and one arm pulled out of a sleeve of his coat. Plum coined the term ‘locked-in syndrome’, in which a patient is aware and awake but cannot move or talk. With Plum, Jennett devised the Glasgow Coma Scale to rate the depth of coma, from a minimum of 3 to a maximum of 15, and Jennett followed up with the Glasgow Outcome Scale to weigh up the extent of recovery, from death to mild disability. Together they adopted the term ‘persistent vegetative state’ for patients who, they wrote, “have periods of wakefulness when their eyes are open and move; their responsiveness is limited to primitive postural and reflex movements of the limbs, and they never speak”. In 2002, Jennett was among a group of neurologists who chose the phrase ‘minimally conscious’ to describe those who are sometimes awake and partly aware, who show erratic signs of consciousness so that at one time they might be able to follow a simple instruction and another they might not. In this way, Plum’s yin and Jennett’s yang launched the field of coma science. Even today, however, we’re still arguing over who is conscious and who isn’t. The same sort of test features in countless medical dramas, when the doctor clasps the hand of a seemingly unconscious patient and says, “Squeeze if you can hear me”. A tightening grip would represent an act of will. That basic interaction between two conscious minds is the only real signature of being both aware and awake, says Owen. But what if the patient does not squeeze? What is a doctor supposed to think then? The public perception of coma (from the Greek koma, meaning ‘deep sleep’) is of a patient lying peacefully, eyes shut, without a glimmer of arousal or consciousness, eventually awakening to make a full recovery. The images of films such as Hable con Ella (Talk to Her) and While You Were Sleeping are a long way from the intubations, double incontinence and uncertainty of the reality: a person cannot be awakened, does not respond to pain, light or sound, and does not undergo a normal cycle of sleep and wakefulness. Menon wondered if elements of cognitive processing might be retained in patients in a vegetative state and discussed with Owen how to use a brain scanner to detect them. In 1997, four months after she had been diagnosed as vegetative, Kate became the first patient in a vegetative state to be studied by the Cambridge group. The results, published in 1998, were unexpected and extraordinary. Not only did Kate react to faces: her brain responses were indistinguishable from those of healthy volunteers. Her scans revealed a splash of red, marking brain activity at the back of her brain, in a part called the fusiform gyrus, which helps recognise faces. Kate became the first such patient in whom sophisticated brain imaging (in this case PET) revealed ‘covert cognition’. Of course, whether that response was a reflex or a signal of consciousness was, at the time, a matter of debate. Steven Laureys, who leads the Coma Science Group at the University of Liège in Belgium, is one of those seeking the source of this illumination. He sits before me clutching a little plastic brain. There are islands of blue on the surface, one at the front and one at the back. He divides it in two, revealing a further blue dot deep inside. This is the thalamus, a two-sided structure that sits atop the brain stem and acts as a relay station for incoming sensory information. “There is no such thing as a ‘consciousness region’ in the brain,” he explains. But subtract the fMRI scans of vegetative patients who are awake and unaware from the scans of those who are awake and fully aware and you find the difference boils down to an ‘awareness network’, the areas marked in blue on his plastic brain. Laureys describes a thought experiment. “If I use a scalpel to remove the blue regions you would still be awake, breathe and move but you would not be aware.” Similar networks exist in other mammals to varying extents, he explains, and the traditional idea that we alone are conscious while all other animals are automata is unlikely to be true. “Given our studies of vegetative patients, we have tended to underestimate consciousness in the past,” he says. This idea of an awareness network chimes with various theories of consciousness, such as the ‘global workspace’ first proposed by Amsterdam-born neurobiologist Bernard Baars. In essence, it suggests that awareness emerges from neurons distributed throughout the cortex in a network that blends sensory information and filters out contradictory or unnecessary information to create a unified picture of reality. Schiff started to piece together this neural circuitry, building on pioneering experiments conducted on cats in the 1940s. These showed how the animals could be revived from anaesthesia by stimulating the thalamus, which plays a crucial part in the brain’s complex orchestra. Studies suggest that a key population of nerve cells (intralaminar thalamic neurons), radiating from this hub to the outer rind (the cortex) and every corner of the brain, have a central role in arousal and waking up. By the same token, they have a central role in coma too: they are more vulnerable than other nerve cells to harm, such as oxygen starvation, which helps to explain why brain damage can lead to unconsciousness. The thalamus and frontal lobe are also more active in conscious and locked-in patients. Together, Schiff and Laureys have identified three broad brain circuits – those in the thalamus, the frontal lobe and the posterior medial complex – that are key to consciousness. At scientific meetings, Schiff has outlined a more detailed version of this neural structure, called the ‘mesocircuit’, which actually consists of two circuits linking the thalamus to the cortex. Some of the connections involved in the mesocircuit stimulate nerve activity, others reduce or prevent it. Overall, higher-level consciousness emerges as a dynamic coalition of these two parallel interactive brain networks. This theory, which he and Laureys are putting to the test, also reveals a way in which one might jump-start a stalled brain. Over the years, a remarkable series of experiments have shown how a mind might be coaxed back into awareness. The case helped him work up the basic neuroscience of how to increase awareness in a brain stalled in limbo by stimulating the thalamus. Armed with this understanding, Schiff has provided insight into the paradoxical discovery that some patients in vegetative states can be awoken with a sedative, zolpidem. One of the best-known cases is the South African Louis Viljoen, who had been left vegetative by a road accident. One day in 1999, Wally Nel, a GP working near Johannesburg, gave Louis the drug to ease the way that he clawed at his mattress. Instead of being relaxed, Viljoen sat bolt upright, smiled, and said: “Hello Mum. Am I in hospital?” Schiff believes that the drug dampens down so-called ‘medium spiny neurons’ in the part of the mesocircuit that links the striatum, the globus pallidus and the thalamus. Because these neurons inhibit the thalamus, quelling their activity can actually boost awareness. Just as a little alcohol can initially stimulate a buzz, so zolpidem can help “turn the brain on rather than off”, says Schiff. A study by Schiff and Laureys shows how slow waves of nerve activity, of the kind seen in sleep or anaesthesia, wash over the brain before the drug is given, but afterwards sluggish synchronicity gives way to the crackle of high-frequency brain waves typically seen in conscious patients. PET images tell the same story, revealing how the drug ramps up brain metabolism. Similar effects are caused by another compound, the anti-Parkinson’s drug amantadine. Laureys’s team in Liège finds that about half of patients in a minimally conscious state show mild improvement in awareness as a result of receiving the drug. In 2005, Schiff applied his emerging understanding of the circuits of consciousness to Jim*, a 38-year-old man who had been beaten and robbed and was left minimally conscious. Jim’s eyes had mostly remained shut. He showed no sign of awareness that his family could detect. His plight seemed hopeless. Eventually, Jim’s mother gave a ‘do not resuscitate’ order to doctors. Schiff thought different. At that time, doctors thought they already knew the answers: no patient in a persistent vegetative state was conscious. Never mind that staring at images made the brain light up, they carped: you can do that in a sedated monkey. Based on previous experience, a brain starved of oxygen as a result of a heart attack or a stroke was unlikely to recover if it didn’t in the first few months. These patients had suffered a fate that many people regarded as worse than death itself: they were functionally brainless. Undead. Doctors, with the best intentions, thought it was perfectly acceptable to end the life of a vegetative patient by starvation and the withdrawal of water. This was the age of what Laureys calls “therapeutic nihilism”. What Owen, Laureys and Schiff were proposing was a rethink of some of the patients who were considered vegetative. A few of them could even be classed as being fully conscious and locked-in. The establishment was doggedly opposed. “You cannot imagine the environment in the late 1990s,” says Schiff. “The hostility we encountered went well beyond simple scepticism.” Looking back, Laureys pauses and smiles thinly: “Medical doctors do not like to be told they are wrong.” Schiff, Laureys and Owen cut lonely and isolated figures at academic conferences, desperately trying to explain their findings to their peers, who remained unconvinced, even antagonistic. The trio’s ideas were condemned as a waste of time. Five months later, a strange stroke of serendipity allowed Gillian to unlock her box. The key arose from a systematic study Owen started with Laureys in 2005. They had asked healthy volunteers to imagine doing different things, such as singing songs or conjuring up the face of their mother. Then Owen had another idea. “I just had a hunch,” he says. “I asked a healthy control to imagine playing tennis. Then I asked her to imagine walking through the rooms of her house.” Imagining tennis activates part of the cortex, called the supplementary motor area, involved in the mental simulation of movements. But imagining walking around the house activates the parahippocampal gyrus in the core of the brain, the posterior parietal lobe, and the lateral premotor cortex. The two patterns of activity were as distinct as a ‘yes’ and a ‘no’. So, if people were asked to imagine tennis for ‘yes’ and walking around the house for ‘no’, they could answer questions via fMRI. Gazing into Gillian’s ‘vegetative’ brain with the brain scanner, he asked her to imagine the same things – and saw strikingly similar activation patterns to the healthy volunteers. It was an electric moment. Owen could read her mind. As the old saw goes, extraordinary claims require extraordinary evidence. The sceptics countered that it was wrong to make these ‘radical inferences’ when there could be a more straightforward interpretation. Daniel Greenberg, a psychologist at the University of California, Los Angeles, suggested that “the brain activity was unconsciously triggered by the last word of the instructions, which always referred to the item to be imagined”. Parashkev Nachev, a neurologist now at University College London, says he objected to Owen’s 2006 paper not on grounds of implausibility or a flawed statistical analysis but because of “errors of inference”. Although a conscious brain, when imagining tennis, triggers a certain pattern of activation, it does not necessarily mean that the same pattern of activation signifies consciousness. The same brain area can be activated in many circumstances, Nachev says, with or without any conscious correlate. Moreover, he argues that Gillian was not really offered a true choice to think about playing tennis. Just as a lack of response could be because of an inability to respond or a decision not to cooperate, a direct response to a simple instruction could be a conscious decision or a reflex. Nachev says that he is weary of stating, as he has time and again to the media, that profound conceptual issues with the techniques used to redefine this penumbra of consciousness remain unresolved. Since Owen’s 2006 Science paper, studies in Belgium, the UK, the USA and Canada suggest that a significant proportion of patients who were classified as vegetative in recent years have been misdiagnosed – Owen estimates perhaps as many as 20 per cent. Schiff, who weighs up the extent of misdiagnosis a different way, goes further. Based on recent studies, he says around 40 per cent of patients thought to be vegetative are, when examined more closely, partly aware. Among this group of supposedly vegetative patients are those who are revealed by scanners to be able to communicate and should be diagnosed as locked-in, if they are fully conscious, or minimally conscious, if their abilities wax and wane. But Schiff believes the remainder will have to be defined another way altogether, since being aware does not necessarily mean being able to use mental imagery. Nor does being aware enough to follow a command mean possessing the ability to communicate. “This is your big chance. Just do your best.” Owen gazed down at 39-year-old Scott Routley, lying on a gurney. Scott had studied physics at the University of Waterloo, Ontario, but his promising career in robotics came to an end when, aged 26, he collided with a police vehicle. Since that accident, on 20 December 1999, Scott had been diagnosed as being in a vegetative state by a well-seasoned neurologist, Bryan Young, and in 2012 his diagnosis was confirmed by Owen’s team, again using traditional methods. As Owen talked to him, Scott’s mouth remained wide open, apparently unaware, the same way that he’d been in the 12 years since the accident. This encounter was filmed by a crew from the BBC. Reporter Fergus Walsh was there to witness the moment that Owen attempted to reach inside Scott’s mind. Owen admits now that he was sceptical that the scans would reveal anything at all. Although Owen’s colleague, Lorina Naci, recounts how the experience of telling the Routley family the news was “quite emotional”, the BBC crew were surprised at their relative lack of celebrations. Not Owen. Scott’s parents, Jim and Anne, and his brother, Ritch, had always been convinced that he was conscious. They insisted he could lift a thumb or move his eyes to indicate as much, even though standard tests had always reached the same gloomy conclusion: Scott was unresponsive. There’s anecdotal evidence that when contact is re-established with the occupant of a living box they are understandably morose, even suicidal. They have been ground down by frustration at their utter powerlessness, over the months, even years, it can take to recognise their plight. Yet the human spirit is resilient, so much so that they can become accustomed to life in this twilight state. In a survey of patients with locked-in syndrome, Laureys has found that when a line of communication is set up, the majority become acclimatised to their situation, even content (again, these insights took some time to be accepted by the medical and scientific establishment – and even to be published in a scientific journal – reflecting the prevailing unease about the implications for hospitals and care homes). Laureys, Owen and Schiff spend a great deal of time with the families and understand these sensitivities only too well. Owen counters that, from his years of experience dealing with the families, they are grateful that doctors and scientists take an interest and are doing everything that they can. “These patients have been shortchanged over the years,” he insists. A recent study showed that many people would grant more ‘moral rights’ to a corpse than to someone in a vegetative state. This surprising finding emerged when a team from the University of Maryland and Harvard University asked 201 people to read accounts of a car accident in which the protagonist lived, died or sank into a persistent vegetative state. The latter was regarded as worse than death. Under the umbrella classification of ‘vegetative’ lies a vast array of different brain injuries and, as a result, even some of the most vocal critics accept that some vegetative patients are not as diminished as traditional measures suggest. Lynne Turner-Stokes chairs a group for the Royal College of Physicians that is revising UK guidelines on ‘Prolonged Disorders of Consciousness’. She remains unconvinced that the exceptional cases identified by Owen, Laureys and Schiff are particularly common or that enough has been done to establish brain scanners as a standard tool for routine diagnosis, particularly when the cost and convenience of these methods are taken into account. When it comes to extending these tests to all patients in a vegetative states as standard practice, “the evidence is just not there yet,” she says. Despite all the hard work done since the pioneering research of Plum and Jennett, there’s still a need for basic spadework to harmonise standards, tools and timescales of assessment for these patients, says Turner-Stokes. More has to be done to ensure that a vegetative patient in, say, the UK is assessed in the same way as one in the USA, and to close gaps in understanding of this very complex group of patients, notably how their brains can change and heal over time. But she stresses that she is simply being cautious, not sceptical, describing the work of Owen, Laureys and Schiff as “important and exciting”. The art of mind reading is constantly being refined. Owen and Lorina Naci have come up with a more reliable way to communicate with patients by getting them to focus their attention while in the scanner. First, a yes/no question is asked, and then a recording is played of the word ‘yes’ repeated several times interspersed with distracting, random numbers, and a similar recording with ‘no’. The participant has to count how many of the correct answer they hear and ignore the incorrect answer. This mental effort (‘selective auditory attention’) shows up distinctively when Naci and Owen examine the brain scans, so they can decode the responses correctly based on activity changes within the attention network of the brain. Yet there are many issues left to resolve. After the initial diagnosis, relatively little effort is made to systematically explore brain function in these patients, says Schiff. There are also minimally conscious patients who may not be able to imagine tennis and so on, when a few exceptional vegetative patients can. Schiff’s team has encountered a patient who had remained vegetative, or in a very low-level minimally conscious state, for more than one year, who had not responded to fMRI, but later regained the ability to make conversation (though, of course, whether they had truly been vegetative is another question). And a 2014 study by Laureys’s group suggests that PET could be better than fMRI at predicting the likelihood that a patient may wake up. It also estimates that the standard diagnostic procedure misses signs of responsiveness in around a third of patients classed as minimally conscious – which Owen notes is consistent with his and Schiff’s findings. Indeed, other limitations are caused by the use of medication during trials or the huge diversity of the patients that are usually collapsed into groups (to spare doctors from carrying out the same procedures on the same patient again and again). When it comes to younger patients, there is a limit to the number of PET scans they can have in a given period because a radioactive tracer has to be injected into the body. fMRI is also hindered by the fact that huge, multimillion-dollar imaging machines – confining and magnetic – are unsuitable for patients whose bodies are affected by spasticity or have been rebuilt with screws, plates, pins and other metal. But more convenient alternatives are in development. Laureys is studying pupil dilation, which is linked with thought (the wider the pupil, the higher a patient’s emotional arousal, while more subtle dilations have been linked to mental functions such as decision making). Another method implants fine electrodes in the hand of a patient to measure ‘sub-threshold’ muscle activity triggered when they are asked to move. Today it is normal to think of the transition between life and death as a question of ‘how the brain is’ rather than ‘how the heart is’. A patient in a persistent vegetative state still has a functioning brain stem and can breathe unaided. They may possess some degree of consciousness and have a slim chance of recovering. By comparison, a PET scan of a brain-dead person reveals a black void within the skull, a barren neural landscape with no chance of sparking back into activity again: their body cannot survive without artificial help. Schiff believes that a combination of devices, drugs and cell therapies, laying the foundations for a new generation of diagnostics and treatments, will illuminate the penumbra between conscious and unconscious. “We’re not quite there yet,” he stresses. Much of the work to date has demonstrated the value of brain scans on populations of patients but, ultimately, they need dependable methods that will work on a patient-by-patient basis, which means precise definitions and standards. They need ways to deal with false positives and false negatives, and to make sense of the impact of a bewildering array of brain injuries, from oxygen starvation to blows and bullet wounds. “We are going to have to do some amazing small-scale studies to show what is possible in one or two subjects before everyone gets simple things done that can help them today,” Schiff says. Eventually, he believes there will be a “cultural shift”. Laureys thinks we may need to start with the language used to describe these patients – he wants replace the loaded term ‘vegetative’ with the neutral ‘unresponsive wakefulness’. Despite the scepticism, the difficulties in dealing with such diverse groups of patients, and the challenges of standardising diagnosis, the research is moving forward. It is already making a difference, enabling a few patients to tell their doctors whether they need pain relief. Scott Routley died in September 2013 with his family by his side. Adrian Owen’s friend Anne remains in a vegetative state. Adrian Owen and Jessica Grahn’s baby boy, Jackson, was born on 9 October 2013. Disclosure: The writer and Adrian Owen have previously co-authored a paper on human intelligence published in Neuron. The assessment of residual brain function in the vegetative state, is extremely difficult and depends frequently on subjective interpretations of observed spontaneous and volitional behaviors. For those patients who retain peripheral motor function, rigorous behavioral assessment supported by structural imaging and electrophysiology is usually sufficient to establish a patient’s level of wakefulness and awareness. However, it is becoming increasingly apparent that, in some patients, damage to the peripheral motor system may prevent overt responses to command, even though the cognitive ability to perceive and understand such commands may remain intact. Advances in functional neuroimaging suggest a novel solution to this problem; in several recent cases, so-called “activation” studies have been used to identify residual cognitive function and even conscious awareness in patients who are assumed to be vegetative, yet retain cognitive abilities that have evaded detection using standard clinical methods.